Call me a wimp, call me wise, but I have yet to cycle in the big bad city. Not a Boris Bike jaunt, nor a scenic riverside ride have I ever completed, which, admittedly is slightly embarrassing. 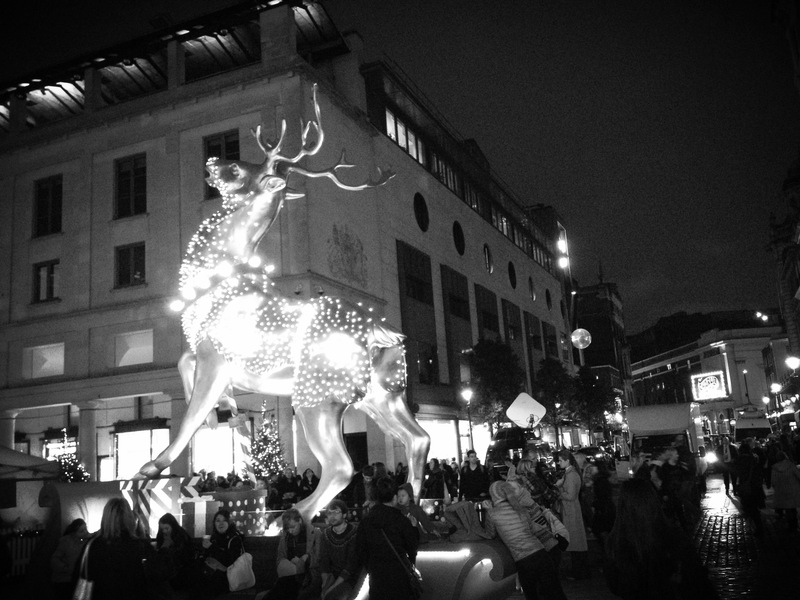 …Or sensible? The amount of cycle-related injuries and accidents is scarily high in London, although the new Cycle Super Highways that are being built around the city promise a safer way to ride around the capital. This current obsession with bikes can’t be ignored – we’ve all been annoyed by those commuters who insist on travelling with a fold-up bike, or been narrowly missed by a speeding Santander. But the rise in popularity of the (not so) humble bicycle is clearly for a reason: a bike is cheaper and more environmentally friendly to use, and doubles up as a form of exercise. This is killing three birds with one stone. After the success of cycling in the London Olympics and the enthusiasm for the recent Tour de France, it seems apt that 2015 should be the year championing the Great Bicycle. Luckily, the Design Museum have got it covered. Cycle Revolution is a brand new exhibition at the Design Museum in Bermondsey celebrating the nations’ favourite two wheeled contraption. Bikes of all shapes and sizes are on display; from Bradley Wiggins’ super fast racer to a 1970s vintage Raleigh, this exhibition shows there really is a bike for everyone. The exhibition focuses on four subcultures of biking ‘tribes’; the High Performers, the Thrill Seekers, the Urban Riders and the Cargo Bikers, proving the diversity and variety in the jobs the bike can do. Track the evolution of the bicycle throughout time, contrasting the 1888 Rover safety bicycle to the foldable Brompton bicycles now so familiar on the morning commute. Apparently the future of cycling could be the wooden bike, but there was also a huge number of modern collapsible contraptions that screamed innovation. . Biking attire and helmets (accessories are obviously important here) are featured, the most bizarre probably an inflatable helmet. I was pretty impressed with the cargo bikes which are rising in popularity; companies using them for deliveries or mums for the school run. Genius, I say – stick the kids in the bike. Admittedly, I entered Cycle Revolution with an overriding impression that a bike is a bike is a bike. How wrong I was. The Design Museum’s Cycle Revolution opened my eyes to the fact that bikes are stepping up a gear. Having never really considered the design and craftsmanship of the trusty bicyle, I now feel enlightened as to the capabilities of our two-wheeled friend, and despite not being an avid bike enthusiast, can now fully the complete variety and innovative craftsmanship of the bicycle. The Design Museum has triumphed again, as far as im concerned, and even though I still took the tube on the way home, I was wheely considering picking up a Boris Bike (pun completely intended). Brunch is one of those fabulous concepts that makes you feel somewhat sophisticated without the need for dressing up, parting with huge amounts of cash, or forfeiting an early night. Perhaps that is why the popularity of the breakfast-lunch convergence has increased significantly over the past couple of years: Instagram is now awash with Prosecco selfies and pancake snaps destined to make anyone munching on a solitary bowl of cornflakes green with envy. A visit from friends, not so au fait with the ways of the big city, seemed like the perfect opportunity to get on the brunch bandwagon. Having had a lovely coffee date in The Black Penny a few weeks back, I decided to revisit this gem of a spot to see what mid-morning offerings they provided. So on Sunday morning, we trekked the onerous 5 minutes to Great Queen Street, where the fairly covert café is situated. Only 5 minutes from Holborn station, past the gaudy fronts of various chains, The Black Penny revels in its subtlety. 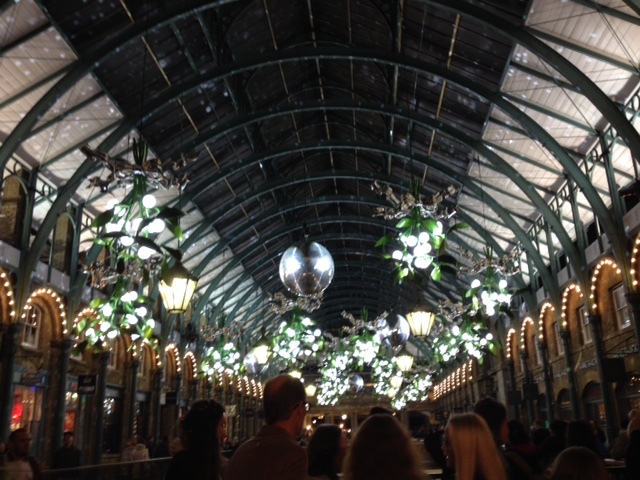 In fact, many people, as I did at first, walk past it without batting an eyelid; the few tables outside, black frontage, and small sign reading ‘The Black Penny’ could easily go unnoticed by a passer-by headed for the lights of Covent Garden. But the hidden vibe, the feeling that you’ve come across a city secret, is part of this café’s charm. Rustic décor, and an immediately inviting counter of freshly baked goods means that on entry, the café feels homely yet cool, quirky but comfortable. Those wise ones who have realised this are already sitting down enjoying a fry up and a latte or a croissant and a cappuccino. What also has drawn a good few punters in is the ridiculously good offer of Prosecco: have brunch at this café and a glass of bubbly is only 1p. Yes, you read that right – ONE WHOLE PENNY. Clearly playing on the namesake, and that is no bad thing. The coffee, I have to say is second to none. Smooth and almost chocolatey, this is a million miles from a bitter filter or your more usual Sunday morning Nescafe. It really is noticeable when you have a Proper Coffee like this; you start to doubt the authenticity of a Starbucks latte and realise this is what the real stuff is meant to be like. Sweet-toothed Friend opted for French toast with caramelised apples and ricotta, whilst Savoury Friend chose the chorizo baked beans with goat’s cheese and an egg. One for a classic, poached eggs on sourdough was my brunch of choice, and a fabulous one at that – simple, yet so easy to get wrong. Here, however, it was so right. We agreed that The Black Penny was perfection on all three fronts. Price-wise, this is as good as you’ll get for a stunning brunch, fabulous coffee and a quirky independent café in central. Expect to pay £10-12 for a delicious mid-morning fuelling that will last you till late afternoon. Despite not making the most of the Prosecco offer, brunch here is available until 4pm at the weekends, and a post-midday glass of bubbles may indeed feature in the coming months. Service is fantastic – utterly efficient, ridiculously friendly and that manner which makes you feel not only like a customer, but a valued friend. The Black Penny is made all the more appealing by the fact it is on my doorstep: it’s basically my local, and I will indeed be frequenting this coffee haven a lot more for my caffeine hit. 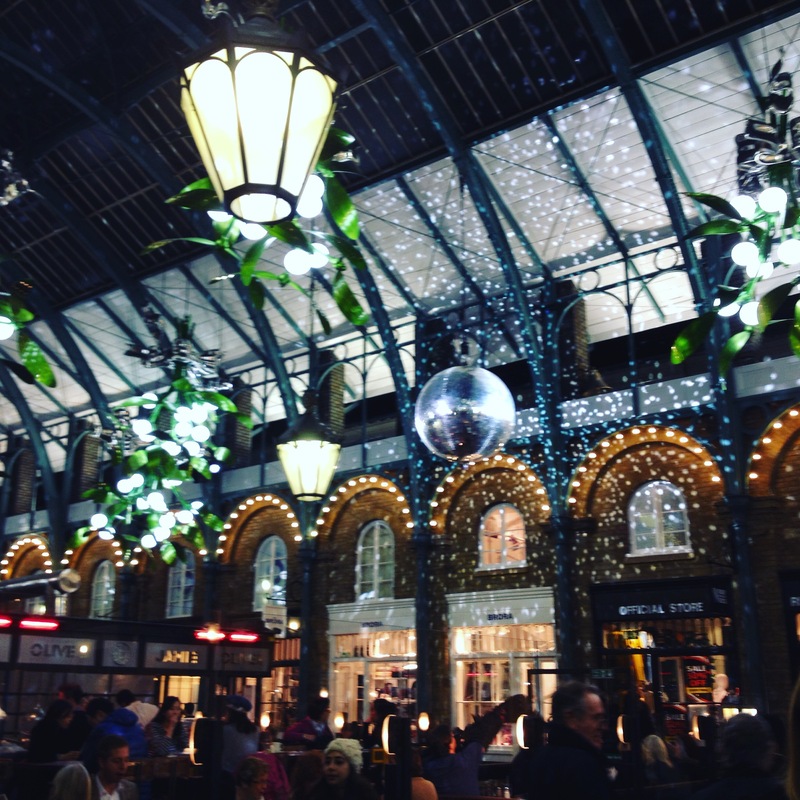 Whether you make a special trip of a weekend for brunch here (definitely worth it) or are in need of a sit down and a cuppa when negotiating the streets of Covent Garden, (step away from the Pret), The Black Penny should be firmly penned in your Black Book. This man, this white-shirted individual making his way into The Cross Keys, has the right idea. He’s after a pint in a Proper Pub, and that’s what he is bloomin’ well going to get… Follow his lead, people. 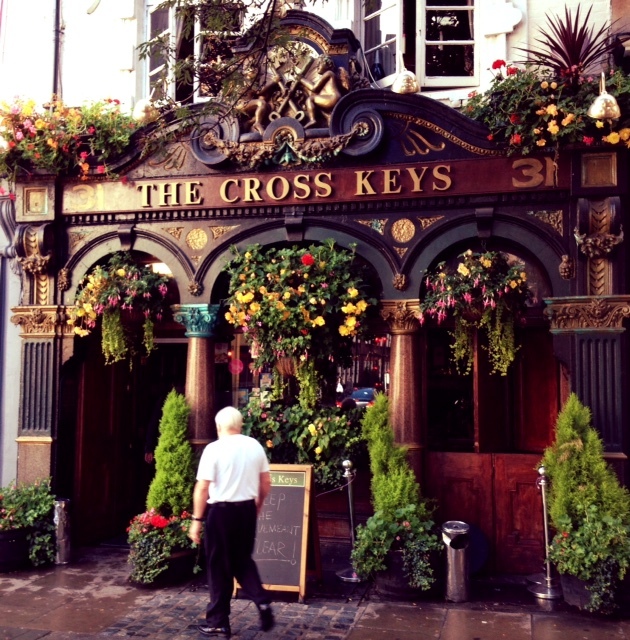 When I stumbled across it on one of my walks through the awesomeness that is Covent Garden, its clear to see why ‘The Secret Garden’ came to mind when I saw The Cross Keys. 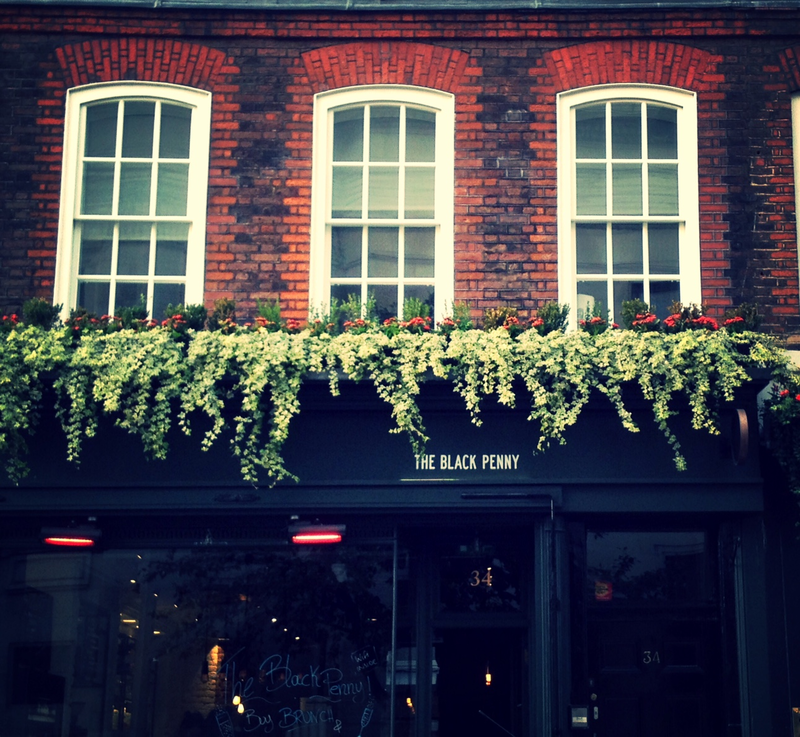 The flowers and plants on the pub front immediately caught my eye – in the city centre, a bit of greenery is always welcome – and the fact that it is slightly withdrawn from the crazy tourist part of Covent Garden, made me want to try out this boozer. If you’re after a pub that’s a little off the beaten track, and usually a fair bit quieter than the ones on the main drag or right by the market, The Cross Keys is indeed a winner. The inside feels a little like a fairy glen: eclectic objects hang from the ceiling and fairy lights are draped throughout. The drinks on offer are pretty varied and at a reasonable price, especially for this part of London (expect two drinks to set you back around £8). This is a real find (not to blow my own trumpet) and I would put this little gem on your ‘To Do Booze’ list asap.